Underground comics have been one of the few things I have been passionate about for as long as I can remember. Oddly enough long before I discovered Robert Crumb, Chester Brown, Tatsumi Yoshiro or even Alejandro Jodorowsky & Moebius I had developed a taste for the unusual truth through the mainstream (but equally subversive) works of Alan Moore. I remember the first time I tried navigating through the disorganized stacks of manga, zap comics and independent publications at Toronto's Beguiling book store. It was an amazing experience finding a whole universe that didn't believe in the cold plastic reality outside. Actually they did believe in it but were willing to criticize it, peel off the masks and accept world for what it truly is. No heroes, no spandex and not as many people being killed off only to return from the dead after sales dropped off. 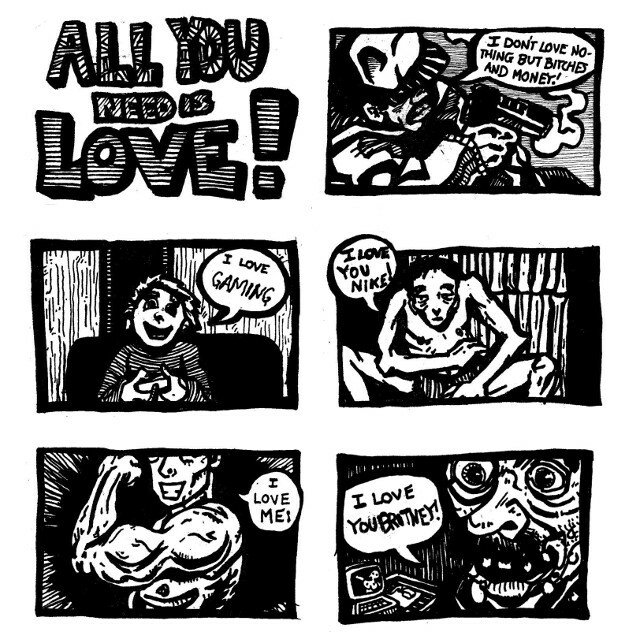 “All You Need is Love” was one of my first attempt at making my own twisted underground comics. Using a simple yet often overstated phrase I wanted to investigate the notion of love as a misdirected superficial ideology. Each panel attempts to point out just how silly our commercial lifestyles are by juxtaposing things we enjoy with things we try to deny. Some of them are worth mentioning as the specific incidents are a little bit dated now although the ideas are unfortunately eternal. In one panel the young girls claim to love “Brittany”, an obvious reference to some has been pop singer who enjoyed brief popularity at that time. The name has probably changed several times since then but I doubt whoever currently holds the title is all that different from those forgotten queens who came before. The second panel that is rather specific is the “I love my artistic license” drawing. Around the time I was drawing this there was a lot of controversy surrounding some artists who decided to kill a cat for some reason. This panel is a direct reference to that incident but again it remains an analogy for all the stupid this people do under the guise of art. If nothing else I learned a bit about story telling through this experiment and realized it is probably better to use symbolic rather than literal metaphors because they have a better shelf life and are these likely to dig up attention for people and events better left forgotten. 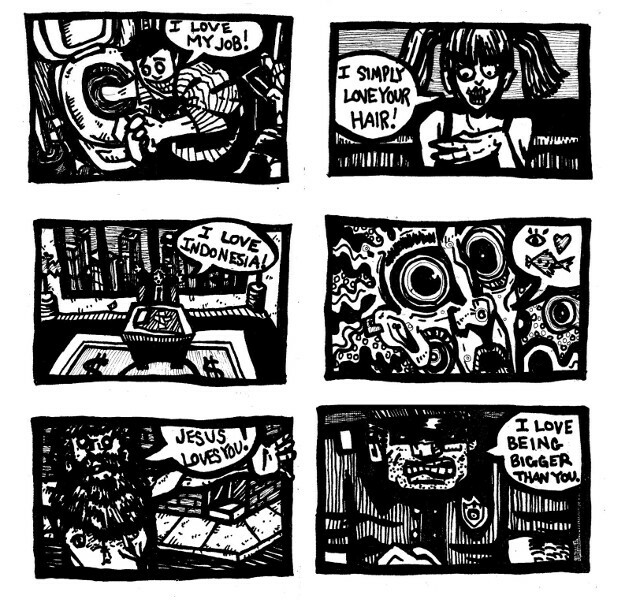 I'm not totally sure but this was made around 2001-02 and originally published as a little photocopy zine that I gave away for free in the streets and at art shows.